At Tuesday night’s City Commission meeting, City staff made a slide show presentation to the commission and those in attendance in the audience regarding the status of the softball/baseball fields. After a brief history of the 8th street Baseball complex where it was explained that since 2000, the City had plans to move softball to the complex, but ran out funding, City Manager Mark Hall stated that with the sale of the property at 7th and Western, the City can now complete the project. The old configuration of ball field space in the City, there were 2 men’s fields 1 women’s field 1 Cal Ripken/Rec. League field, 3 Babe Ruth/Men’s Baseball fields, and 4 soccer fields. 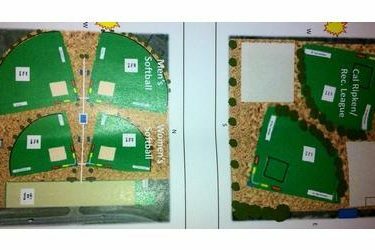 With the new configuration proposed at Tuesday’s meeting there would now be 2 Men’s fields, 2 possibly 3 Women’s fields, 2 possibly 3 Cal Ripken/Rec. League fields, 1 possibly 2 Rec. League Girls fields, 3 Babe Ruth/Men’s Baseball fields and 4 soccer fields. However for Tournament Play, some of these fields can be could be converted, allowing for 5 Womens fields, up to 9 Cal Ripken/Rec League fields and 6 Rec League Girls softball fields. It was also presented to the Commission that survey, engineering, bid documents, and demolition of old fields should be completed by September 1st, site preparation, and new construction running from September 1st with an expected completion date of December 1st, weather permitting. After a question and answer period from the commission and the audience, the Commission voted to approve the plans as presented. Before the the Commission was also a proposed funding option for the fields. With the timeline being crucial to get everything ready for play by early spring, construction needed to be started as soon as possible. Even though the City has signed sale contracts, the property at 7th and Western has not closed pending title work, deeds, plats, engineering, and other details associated with the sale of property, it was proposed to borrow $850,000.00 from the Streets, Drainage, and Capitol Improvements portion of the 1 cent sales tax, with the sales proceeds and any unexpended amounts from the new ball field construction project to be returned to this fund. After brief discussion, this funding mechanism was approved by the Commission.